A good documentary should be able to engage an audience of people interested in the filmmaker’s subject. However, a stellar documentary should be able to make an impression upon an otherwise disinterested audience. For example, a film about farming communities in America may not necessarily appeal to a wide range of viewers. Farming isn’t, for many of us, one of those subjects we’ve always secretly wanted to learn more about at some point. Most of us have probably never felt an inclination to Google it, (and these days, we google everything. This is why Farmland, directed by Oscar, Grammy and Emmy winner, James Moll, is ultimately a success. After a bit of a slow start, Farmland finishes strong as it eventually transforms into a fascinating, emotional narrative with more layers than we might have expected. In the beginning of Moll’s documentary, we meet various farmers who each break down what they know to be the common misconceptions about who they are and what they do. The American Gothic painting is, as one farmer explains, what many people envision when they think of farmers. Few American consumers know or understand what it means that ninety percent of their food begins on a farm. 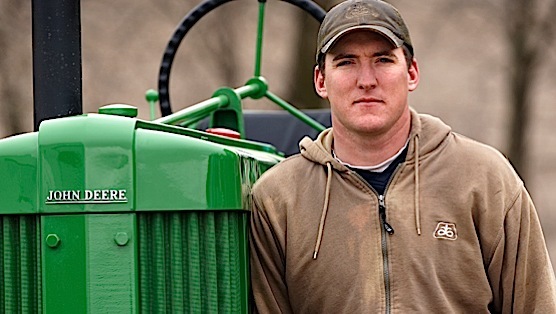 Of all the farmers we meet, one character stands out for obvious reasons. Her business is called One Woman Farm, which proves to be a completely accurate name. While the other farmers all inherited their businesses, have a slew of employees, and/or work alongside their parents in some capacity (which also makes for interesting narratives), the One Woman Farmer started by herself and built her business from the ground up (literally and figuratively). Farmland plays a bit too much like an educational film at first, introducing the audience to the logistics of the business, and using the unique stories of each farmer to explore the challenges that accompany each style of farming. It’s an important part of the film, but it does drag a bit. Things pick up as we enter the lives of each farmer—the son who inherited the farm at a young age as a result of his father succumbing to cancer; another father preparing to pass his farm on to his son; and another son just starting his own farm after years of working for his father. It would be exclusively a story of sons and fathers were it not for the One Woman Farmer, and her profile is one of the most interesting aspects of Farmland. Each farmer also opens up about organic farming, use of pesticides, genetically modified organisms (and the demonizing of those farmers who use them), commercial farming versus community-supported projects. When they get into the branding and advertising of their products, Farmland begins to play like an episode of Mad Men, as marketing ploys are exposed and explored. Climate change is also a big part of the discussion. Snow in April is practically a matter of life and death for these farmers, and droughts across the nation also take their toll on the business. There’s also an intimation of the class divide in our society, as the viewer must come to terms with the fact that our society values one particular brand of sweat over another. The sweat of a Wall Street wolf, for example, trumps the sweat of a farmer working into the night. Moll is also telling a love story of sorts, as it becomes clear that these men—many of whom went off to college, had plenty of options and still chose to become farmers—are laboring out of love. Like artists, they’ve chosen a difficult career path but still have to support families. The cinematography reflects this powerful relationship between farmer and land with beautiful shots of huge machinery up against a majestic sky. At first, these moments seem strange and out of place in a film about farming, but Moll is clearly trying to paint a different picture (perhaps in an attempt to fight against traditional public perception—and it works). A documentary about farming should not, in theory, move the audience to tears, but Moll knows how to tell a story within a story. That he succeeds in turning Farmland into a love story and a father/son Scorcesian-like elegy is a testament to his skill. One final shot of a corn husk on a desk—representative of a lost father, his memory and legacy—and the song “This Land Was Made for You and Me” (performed by Everclear and Liz Phair) perfectly summarize and concludes this impressive work.